Walk on clouds with our new Foot Care range! 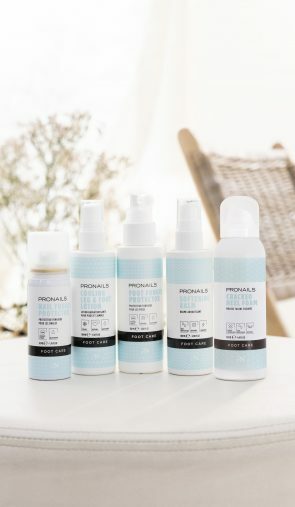 This new Foot Care range combines the power of professional products with skin-softening freshness. The key ingredient is eucalyptus oil, a powerful natural disinfectant with an anti-inflammatory effect, ideal for sensitive and easily irritated skin. A wonderful moment of care guarantees both during the salon treatments and at home. This new ProNails range is refreshingly powerful in every sense of the word and offers a beautiful result thanks to the equally beautiful products. Not convinced yet? Then be sure to visit our ProNails booth for a demonstration.